Adam Hayton, scored with a penalty for Glasshoughton Welfare. Glasshoughton Welfare slipped to their second narrow defeat in four days against promotion contenders when they lost 2-1 to AFC Emley in Division One of the Toolstation NCE League on Tuesday night. Welfare started much stronger than they had in their 1-0 loss to leaders Penistone Church last Saturday and matched their higher placed opponents for most of the first half. Emley threatened when keeper Andy Holland had to get down quickly to smother an effort from an onrushing attacker. The keeper then came to the rescue when pushing Joe Brennan’s shot away. At the other end Connor Glavin hit a speculative 30-yard shot which failed to trouble to trouble Graham Maclachlan. Emley took the lead on 34 minutes when a cross from their right was knocked back for Ash Flynn to score. Flynn then flashed a shot wide and had a 25-yard shot saved by Holland. Kieran Ryan also went close. Emley doubled their lead three minutes into the second half when after Holland denied Flynn the resulting corner saw Liam Schofield fire home with a shot that was deflected. As Welfare tried to come back Schofield foiled them with some excellent defending as he somehow got his foot to a ball heading for the unmarked Nathan Keightley. Holland defied Flynn again with an outstretched leg before Welfare pulled a goal back on 86 minutes. After a visiting player handled in the area Adam Hayton slotted home the spot kick. With virtually the last kick Welfare substitute Andy Horbury had a great chance to earn his side a point but he blazed the ball over when through. 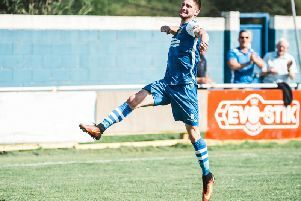 Glasshoughton joint manager Lee Vigars said: “We’re obviously disappointed, but there’s no disgrace in that performance against a very good Emley side who will push for automatic promotion this season. “We switched off for a second for the opener and a big deflection beat Andy Holland for their winner. Andy Horbury had a great chance to win us a point at the end but it wasn’t to be. Welfare put up a good display last Saturday away to pacesetters Penistone, who won 1-0 courtesy of a sixth minute Dale Kelly goal. The home side started on the front foot and were soon ahead when Kelly won the ball on the left and cut inside before beating Andy Holland. Tom Jones headed a corner just over as Penistone threatened again and Houghton were grateful to keeper Holland as he made a great save with his feet to deny Danny Joynes. In the second half Welfare upped their game and Glavin scuffed a shot just wide before his well taken free-kick was held just under the bar by confident keeper Adam Rhodes. The goalkeeper then did similar with a shot from Nathan Keightley while Houghton did bundle the ball into the net from a corner only for Ashley Scothern to have been deemed to have fouled Rhodes. Welfare came close again when Lewis Akeister’s shot was palmed onto the roof of the net by Rhodes. Just before the end substitute Olly Maude fed Keightley a great ball, but the diminutive striker’s first time shot was inches wide. With Rhodes tipping a stunning shot from Josh Morley over, Welfare went close again and could count themselves unlucky not to get a point. This Saturday Glasshoughton are at home to fourth from bottom Teversal (3pm). They are also in action next Tuesday when aiming to pull a giantkilling off in the third round of the West Riding County cup, away to Farsley Celtic (7.45pm).